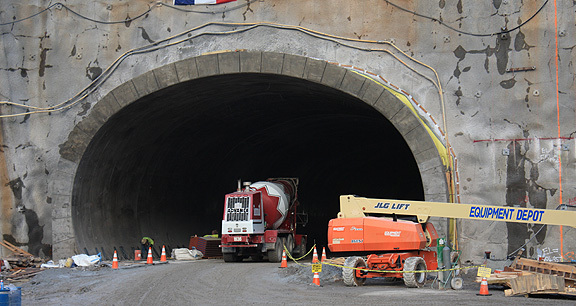 Project obstacles and solutions: The East End tunnel is key to a new bridge system that will connect I-265 on either side of the Ohio River in Louisville, Kentucky and southern Indiana. The north and southbound tunnels go under the historic Drumanard Estate before the final approach to the river. The tunnels traverse 1,700 feet underground. Walsh Vinci formed up the walls and ceilings as a monolithic concrete cross section arch. This included using a rolling formwork with a hydraulic, articulated structure to extend and support the forms. This was moved into place before the forms were extended along the stone walls and ceiling. Concrete was then pumped into the formwork beginning with the lower walls and then extending to the top of the forms. The formwork provided three levels at which the finishers stood as they placed the concrete. The formwork was positioned in one place until the concrete was set and then rolled to the next 40 foot section of the liner. The concrete mix for the liner was unique in its composition. IMI QC/QA designed a high slump concrete mix with attention to the size of the aggregates to keep the it flowing down the forms. This helped to fill the forms and provide a smooth finish. The liner was poured in 40 foot sections. Each of these pours averaged 350 yards of concrete to finish a section. There are a total of 84 liner pours. The forms were retracted and moved after the concrete had reached a strength of 2,000 psi. Walsh Vinci used a Windsor Probe to test the density of the concrete before the formwork was moved. IMI QC/QA used a high range water reducer in the mix to increase the slick finish of the walls and to help with early strength to keep the project moving. The result was a finished wall and ceiling that needed no rubbing after the forms were moved. For more information on specialty concrete, contact the sales representative for your area. Click here.